JetBlue announced yesterday that it will begin offering flights from New York and Boston to London in 2021. How will this impact the market? To find out, our team at Hopper utilized our historical archive of several trillion flight prices from the last five years. With a strong dollar, low prices and increasing demand for flights to the UK, JetBlue's announcement of new service from JFK to LHR comes at a great time for travelers! 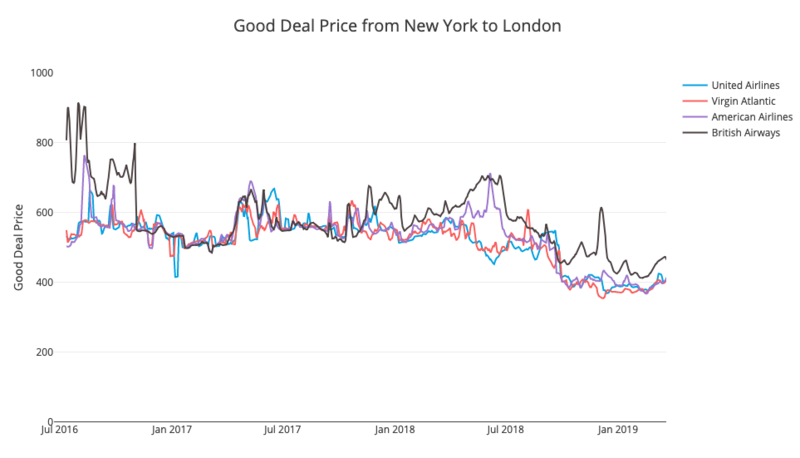 Prices from New York to London on all major airlines have been falling since summer 2016, and are likely to remain low in the short-term with increased competition from Low Cost Carriers and the Brexit extension to October 2019.
Leisure travelers should currently expect to pay $597 round-trip for flights from New York to London. Prices to London are down 4% (or $25) compared to last year and 17% (or $86) compared to 2017. Boston leisure travelers can currently expect to pay $577 round-trip for flights to London. Prices to London are down 10% (or $60) compared to last year and 16% (or $106) compared to 2017. When JetBlue joins the fold in 2021, expect New York to London prices to drop further, as they bring more competition to the international segment. Figure 1: Good Deal Round-Trip Price from New York to London. The good deal price represents what a typical leisure traveler should expect to pay with some advance planning. Competition from JetBlue typically drives down prices substantially when they enter a new domestic market. In some cases, the carrier drove down prices by more than 50% on a route. When it comes to international markets, the impact on prices isn’t quite as drastic, though prices do tend to drop overall. 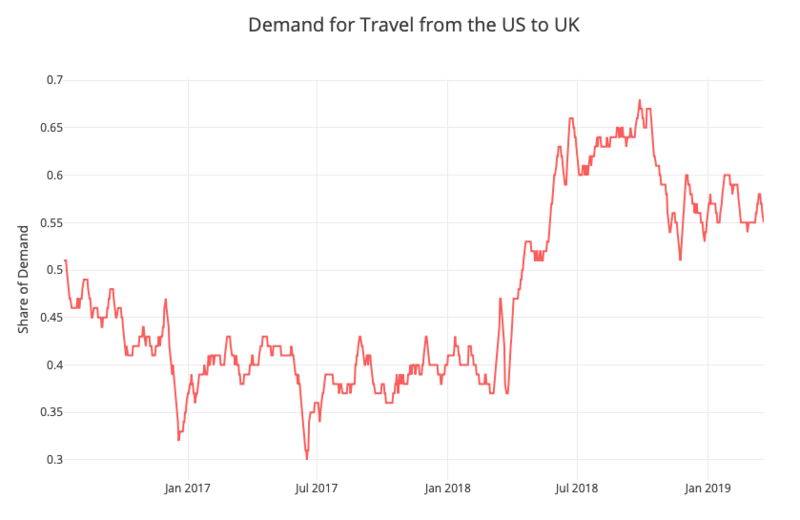 Historically, JetBlue has caused prices to drop by 12% when it enters an international market, so we’re expecting a comparable drop once it starts servicing flights to London. That said, there have been instances where international competition from the carrier has lead to more significant price cuts. For example, when it launched flights from Fort Lauderdale and JFK to Trinidad and Tobago, it spurred savings of up to 26%. It’s rumored that the company may announce more routes to European destinations such as Paris, Amsterdam, and Dublin. We’re already observing historically low prices to Europe with prices averaging $637 round-trip from US origins this spring. If JetBlue does enter additional European markets, the competition will push down those prices even further. Hopper predicts future flight prices with 95% accuracy up to one year in advance of departure. We collect 25 to 30 billion airfare price quotes every day, and have built a historical archive of several trillion prices over the past several years. By combining current prices with historical trends, Hopper can predict how prices are likely to change in the future.